These are the results of a cool blue, turquoise, crossed with a warm yellow, gold. And these are the result of crossing a cool red, fuchsia, with a warm blue, cobalt. 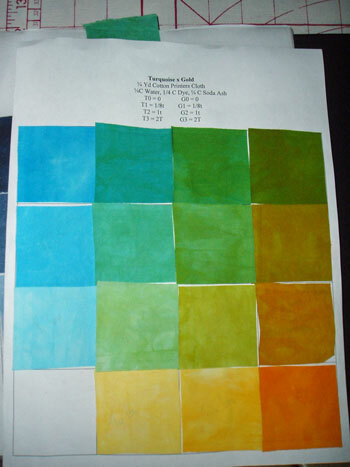 This set of tests gave me 12 grids, all with wonderful colors. 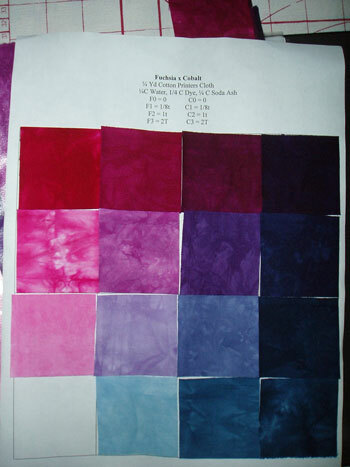 Now that I see what great colors I’m getting, I kinda wish I was using better fabric. This is Dharma’s printers cloth, which is ok, but not really great fabric. I wanted something cheap enough that I could use fat quarters kinda like kleenex, and keep from getting all paralyzed about not making ugly fabric. Oh well. Live and learn. You are currently browsing the J.Sews blog archives for August, 2008.